Set includes a high-quality, vinyl oval eraser and matching, two-hole pencil sharpener. White eraser is latex-free. The manual pencil sharpener is made of metal. 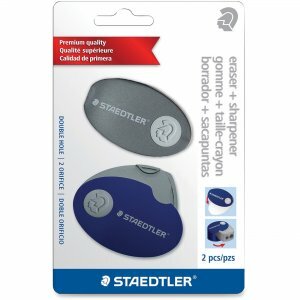 Both eraser and sharpener swing out of the pivoting cases when in use. When not in use, swing back into cases to keep them clean and well-protected. Sharpener's smaller hole sharpens black lead pencils to a sharp point. Larger hole sharpens colored pencils and crayons to a blunt point for a softer line. Sharpener pops out for easy cleaning and emptying of shavings canister.